Earn 1 Point for every $1: Get 0 points rewarded to you when you buy this item. The perfect gift when you're just not quite sure which dress up or costume your little one wants! 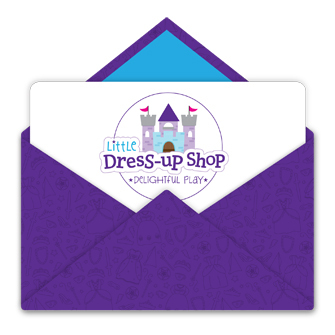 Gift Certificates from LittleDressUpShop.com are delivered digitally. So you or the lucky recipient won't have to wait at the mailbox for a plastic card. Upon approval of payment at checkout the Gift Certificate Code will be immediately emailed. Then you can start using the code right away! But please make sure to read the terms and conditions below on this page. Fill out the information below to send (email) your Gift Certificate directly to the recipient - or you can skip this section and have it sent (emailed) directly to you. Either way you will always receive a copy of the Gift Certificate email. Question: Will my LittleDressUpShop.com Gift Certificate Expire? Answer: Happily we can say NO, there is no expiration date for Gift Certificates. Question: Will I have to pay shipping to get my Gift Certificate mailed to me? Answer: The short answer No, shipping is not required when you purchase a Gift Certificate alone. Question: How do I use my Gift Certificate Code? Answer: When you are ready to purchase your order with the Gift Certificate Code, on our checkout page we have an "Apply Coupon:" box which is where you will enter your code - then click Go or Apply and your Total will deduct an amount based on your Gift Certificate Balance. Question: How do I see my Gift Certificate Balance? Answer: All you have to do is log into your account by clicking the Track Your Order link at the top of the page -use your email to log into your account and then once on the My Account screen you will see your Gift Certificate purchases at the bottom and then you can click View Details to see your balance for all Gift Certificates purchased. We don’t just have customer service we provide "Exceptional Service!" PLUS we provide a 100% Satisfaction Guarantee on all products we sell. Which equals almost 10 years of happy children worldwide!